CONFUSED Ertugrul Saglam and BESIKTAS TRANSFERS LAMINA DIATTA! Confused Besiktas completed the transfer of Senegalese soccer star Lamine Diatta. Diatta who is a favored defense player will sign a two-year contract with the Istanbul team. The 32 year-old player will get one million Euros for a year. The black player who was playing for St. Etienne is expeced to arrive in Istanbul on Thursday. After the friendly match ,Roberto Carlos was asked by match referee Huseyin Gocek to have his jersey. Fenerbahce draw against Ukraine's Shakhtar Donetsk by 1-1. In the 69th minute, Uğur Boral scored the Fenerbahce's goal.but,in the 88th minute,Gladkyy scored the equlizing goal.The game ended with a score of 1-1. Trabzonspor were handed a 2-1 home defeat to Romania's Otelul Galati in the second-leg of the Intertoto Cup third round to miss out on a place in the UEFA Cup. Ceyhun Eris put Trabzonspor ahead as early as the sixth minute, giving the home side the upper hand as they scored an away goal in the 2-1 first-leg defeat. 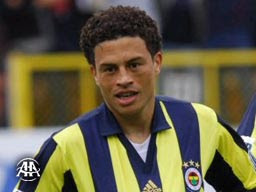 Brazilian Alex de Souza was declared CAPTAIN OF FENERBAHCE on the club's Web site. Having scored 76 goals in 149 games since his arrival at the Istanbul club in the summer of 2004, Alex has become the leading force behind FenerbahCe's two championships in two years. The 30-year-old was also the scoring leader in the Turkcell Super League with 19 goals. Mehmet Aurelio is set for the role of vice captain. Meanwhile, Roberto Carlos makes his debut appearance for FenerbahCe against Ukranian Shakhtar Donetsk Saturday at 8:00 p.m,local Turkey time. After Tuncay and Umit Left the Fenerbahce, Fenerbahce has not find a captain of the ship yet!....Onder Turanci who plays on the defense said" he is ready to be captain to Fenerbahce"
He also said that it will not be a problem if Roberto Carlos is assigned as the captain: "Carlos is a great player; everyone knows that. I believe that we will learn a lot from him as a team. We are happy to have him with us." According to Nigarian media, Babatunde is expected to become the property of Galatasaray today. The Msida St Joseph FC website yesterday announced officially that Babatunde was to sign for Galatasaray. Galatasaray cuts Necati, Hasan Kabze, Orhan Ak and Cihan!. GALATASARAY AND FENERBAHCE BACK HOME! turkey(turkish) soccer(football)...turkey turkcell super league..
Galatasaray soccer team is back in İstanbul after pre-season camp in Germany. Also Fenerbahce returned back to Istanbul on Monday as they ended their pre-season camp in Austria. Galatasaray resume practice at the Florya Metin Oktay facilities on July 24.Galatasaray will play friendly matches, including with İstanbulspor at Ataturk Olympic Stadium on July 29, Boluspor in Bolu on Aug. 1 and Karşıyaka at İzmir Ataturk Stadium on Aug. 4. Fenerbahce will continue with the pre-season preparations in Samandra training facilities, this week.Fenerbahce beat Sparta 1-0 on Saturday night, last preparation match in Austria. After this match ,in the locker room,Kezman fought with Ugur Boral after the argue on the field after the game. According to Ghanaian reports,Yusif Alhassan Chipsah, is on his way of signing a two-year deal with a Turkish Super League team. In a telephone interview, Chipsah, confirmed the deal but declined to mention the name of the Turkish club claiming negotiations are on-going and will be proper if the named is withheld for now.The reports claim that he may be heading to Fenerbahce to join Stephen Appiah. Stephen Appiah, who plays for Fenerbahce,has agreed to join the Bundesliga side Schalke 04, the New Anatolian newspaper reported on Monday.Appiah, the captain of the Ghanaian national team, is now waiting for Fenerbahce and Schalke 04 managers to close the deal.The 27-year-old had been the subject of interest from both the English premier league side West Ham and Schalke 04 this summer, the report said.Appiah joined the Fenerbahce team in the summer of 2005 from Juventus. Udinese, Parma and Brescia were Appiah's former clubs, before joining Juventus. BECKHAM FEVER BRINGS SOCCER TO DIFFRENT LEVEL! I know this is Turkish soccer site, but, I live here in United States. I have to talk about what I saw tonight as far as Beckham's day in the sun before any Turkish media writes and talks about it!.... It was great!..... Although he only played only for twelve minutes...the coverage by ESPN was fantastic!..This is first time I see American media covered the soccer event like this!The stadium was full..THERE was a lot of Hollywood faces at the match and even Shaque and Kevin Grant from NBA was there! front row tickets went for, two thousand dollars..
LA Galaxy, sold more than three hundred thousand Beckham jerseys and so far, Galaxy, cashed in 25 million dollars, since Beckham signings. at the end the friendly match Chelsea won the match but ,in a long run, I think United State's soccer took a big turn for better. Here is why.......You have cables TV's will broadcast the matches live and big name sponsors are paying big bugs to getting in to the action... Most of all, The baseball loving American media is going to talk about soccer in the United States now!.... Before ,they were even scare to mention it on their news programs!...just take look at ESPN , if you live in the United States!.. 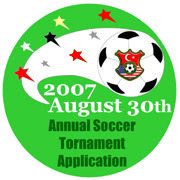 The soccer sun, will shine in LA and in America much different now! Beneath a blazing early morning sun, the Los Angeles Galaxy's brightest star arrived. David Beckham became an official member of the Galaxy on Friday as the England soccer star and international media icon greeted a fervent Home Depot Center crowd, throngs of paparazzi and scores of media. By joining the Galaxy and Major League Soccer, Beckham said he would take on an immense challenge but one that he was more than happy to confront. "I've always looked for challenges in my career and something exciting in my life," Beckham said. "My family has now moved to Los Angeles. It's something we're looking forward to, something we're very proud of and in our life everything's perfect." An estimated crowd of 5,000 supporters -- mostly season-ticket holders -- greeted Beckham with cheers and chants as dignitaries such as Los Angeles Mayor Antonio Villaraigosa, MLS Commissioner Don Garber and AEG President Tim Leiweke each took turns welcoming Beckham to Los Angeles. 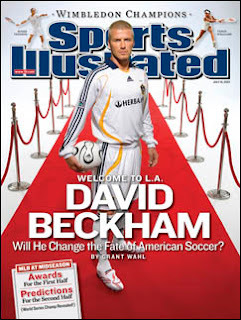 Villaraigosa even donned a white Galaxy Beckham jersey and presented the new L.A. superstar with a plaque. "This is an important day not just for the Galaxy, not just soccer at the professional level but a great day for the future of soccer," Villaraigosa said. "It should be here in the city of Los Angeles, the city of America's hope and promise, where we come from every corner of the Earth." Beckham was preceded in the presentation by wife Victoria, who took time to pose for the dozens of assembled photographers and waved to the cheering onlookers. The couple arrived in Los Angeles late Thursday with sons Brooklyn, Romeo and Cruz; the Beckhams will take the weekend to settle in to their new Beverly Hills mansion before Beckham reports to work on Monday. For Beckham, his family and soccer are priorities one and two in his life. "For me the most important thing in my life is my family. The second thing is the foo... is the soccer," Beckham corrected himself. "I'll get used to that." Despite the ever-present media glare, Beckham said he was just a normal guy and would relish the chance to live in Southern California with his family for years to come. "Believe it or not, without all the hype and all the circus that does surround me, I'm a pretty normal person," Beckham said. "I try to live my life as normal as possible. I especially try to make my children's lives as normal as possible. Once I've done this in front of all these thousands of people and once I've done this in front of all the world's press, I'll go back home and jump in the pool with my kids." If Thursday and Friday were any indication, the media spotlight will be on Beckham as intensely here as it has been throughout his career. When the Beckhams arrived at Los Angeles International Airport on Thursday, paparazzi were assembled and snapped pictures of a well-dressed couple walking from the terminal to their cars. Friday's presentation was beamed across the world on television and Internet feeds. Beckham has already had offers to appear on television talk shows but turned them down as he plans on focusing his efforts on his family and the Galaxy. "I've had that throughout my career, people questioning me doing different things outside of my soccer career," Beckham said. "I've always struck the right balance and I always will do because I've always handled it in the right way. I've always made sure that my soccer is my first priority just behind obviously my family. I've always got the right balance and I will do that here." Now that he's arrived, the Galaxy's puzzle is seemingly finally complete. The club will hit the field twice next week and four times in the next 14 days for friendlies and SuperLiga. However, Beckham's ankle is still a bit troublesome. "My ankle, I ran on it for the first time three days ago. It felt slightly unstable still and there's still a little bit of swelling," Beckham said. "Hopefully I'll be training in the middle of next week and be ready for the game." 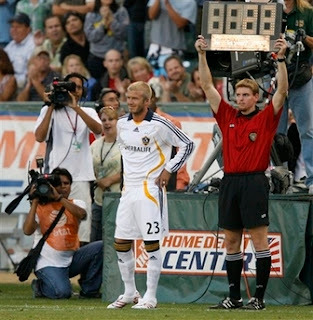 Beckham will likely make his Galaxy debut against Chelsea on July 21 and will compete in SuperLiga matches against Pachuca (July 24) and Chivas de Guadalajara (July 28) before the club hits the road for three-plus weeks. Beckham injured his ankle in his final game with Real Madrid, a 3-1 La Liga-clinching victory on June 17. Last week while vacationing in the south of France, Beckham said he cycled some 45 kilometers and felt that with some therapy the ankle should be fine. In the long term, though, the ankle will likely heal and Beckham will carry forth with the challenge of hoisting MLS into the national spotlight. "Potentially in the states, soccer could be as big as it is everywhere else around the world," Beckham said. "I'm very proud to be part of that and am going to be part of that for the next five years and maybe a few more years later." TUNCAY SANLI joined in his first training session with his new Middlesbrough team-mates in Austria yesterday, with manager Gareth Southgate shocked by the crowds in attendance to witness it. Tuncay flew straight to Boro's training camp in Austria from his Turkish homeland on Tuesday, rather than travel from Teesside with the rest of the squad. And, after scoring an excellent goal in front of his new colleagues in Bad Waltersdorf, the 25-year-old has spoken of the welcome he was given from the Middlesbrough players on his first official day. "I want to be successful in Middlesbrough and I am sure I will be," said Tuncay, whose first session also resulted in him receiving a booking from assistant manager Malcolm Crosby. "My new team-mates are great, they have all played a part in helping me settle in quickly. They have helped me even though I have a little bit of a problem with the language. 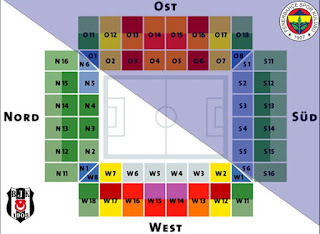 The language of football is common throughout the whole of the squad. That helps." Around 20 journalists were in Austria to witness Tuncay's first training session, with Southgate claiming it was akin to the day when Paul Gascoigne signed for Middlesbrough. And on Saturday, when Boro play their first pre-season game against Schalke, there is expected to be a decent crowd at Bad Radkersburg. Some fans from Teesside have made the trip to Austria, but there will be a heavy presence of Turks at the match. Both Fenerbahce, the club Tuncay left on a free, and Besiktas are in Austria and supporters of both clubs are expected to make the trip to see their country's golden boy make his bow in a Boro shirt. It is beyond pre-season that the striker is looking to, however. He is targeting more important European games with Middlesbrough in the future. "When I first started training yesterday I was very excited but I am a professional player and I soon got used to it," said Tuncay. "I am very happy and I wanted to come to this club so I'm really looking forward to the challenge. "My aim was to play in Europe one day and I have done that in previous seasons. It is also very important for me to play in the Premier League, that too is going to happen. But I want to get Middlesbrough back into Europe." Tuncay trained with Ayegbeni Yakubu yesterday, although they may not start the new season alongside one another, with Portsmouth boss Harry Redknapp set to make another effort to land the multi-million pound striker. Redknapp is hoping to land a forward, currently based in Spain, for less than Boro want for Yakubu, but he is likely to return for the Nigerian if he fails to land his man. Redknapp has confirmed he is still looking to add one more striker to his ranks before the start of the season on August 11, despite concluding a deal for Preston's David Nugent. Nugent, after taking too long to accept an offer to sign for Sunderland, completed a £6m switch from North End yesterday after passing a medical at Fratton Park. Middlesbrough want £12m for Yakubu after being rebuffed in their attempts to secure Pompey midfielder Gary O'Neil as part of the deal, but could be willing to accept less. Portsmouth face competition from Manchester City, where Sven Goran Eriksson views Yakubu as the ideal strike partner for Rolando Bianchi, on the verge of a move from Reggina. If Yakubu does depart, Southgate will hope to have made inroads towards his replacement, having already been told that Alan Smith is reluctant to move to the Riverside. Former Inter Milan striker Mohamed Kallon, 27, claims he is within Middlesbrough's radar, although Derby, Fulham and Wigan are all weighing up a £1.5m swoop for a player once suspended for six months after testing positive for the banned steroid nondrolone. According to British media , Appiah is angry! Fenerbahce's Ghana international midfielder Stephen Appiah claims,, Fenerbahce have wrecked his chances of a move to West Ham this summer.He told The Sun: "I am very angry about stories saying I want to stay at Fenerbahce indefinitely. "West Ham have expressed strong interest in me and I think Fenerbahce will have to listen to their offer. It is my ambition to play in the Premier League. Ghana captain Stephen Appiah has asked his club Fenerbahce to talk to West Ham over a possible move to the English Premiership. The Turkish champions are reluctant to release the midfielder, having turned down several offers for the 26-year-old. With the imminent departure of Yossi Benayoun to Liverpool, West Ham are keen on using the money earned from the sale of Nigel Reo-Coker to enter the chase for the Ghana captain. Appiah is reported to be frustrated at efforts being made to keep him at Fenerbahce and his absence on the first day of the team's training camp in Austria has prompted fears of a protest from the midfielder. Appiah said: "If West Ham United have expressed strong interest in me and I think Fenerbahce will have to listen to their offer and other offers on the table for me. "It is public knowledge that I want to move to England in the interest of the education of my kids, who still live in Italy because of their education. "At the start of last season I turned down several offers from top clubs in Europe just to help Fenerbahce lift the title because of my love for the team and fans. "Even while I was injured I continued to play to secure the title so they should also take my interest into consideration and listen to the offers. "It is only fair that having served them with all my heart they should also take my interest into consideration even though I understand I have a contract with this great Turkish club. "I want my future to be sorted out soon so that I can make my future plans now." The midfielder could have joined for Scottish side Celtic for US$11m last month, according to the Times but his reported demands for Â£60,000-a-week were too much for Celtic to stomach. However, Celtic could bring Appiah back to the negotiating table if Thomas Gravesen is offloaded to English Championship side Sheffield United. German side Schalke are also reported to have upped their offer to secure Appiah ahead of their participation in the Uefa Champions League. Valencia and Juventus have also been linked with a summer move for Appiah. Besiktas Black Eagles new transfer Rodrigo Tello Chile has been banned after the incidents accured in the Copa America. Apart from Tello ,five other iternational players have been banned from representing their country for 20 games after an incident at a hotel in Puerto Ordaz, Venezuela. The senior internationals were punished for getting drunk, trashing a hotel room and verbally abusing female staff members at the hotel. SOME LIKE IT SOME DON'T! 8 foreign players. They will end up sending one or two players from their roster. On the other hand Besiktas and Galtasaray still has one player room on their roster. 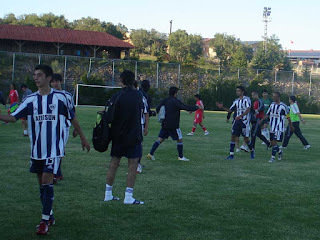 In the UEFA Intertoto Cup second round first leg Trabzonspor, trashed Vllaznia ,6-0. Ersen Martin scored the first goal on 12 minutes before Ceyhun Eris (32) and Cağdaş Atan (39) extended the advantage. In the second half, Trabzonspor continued to dominate with Serkan Balci (51) and Martin (59), again, adding further efforts before Omer Riza scored the sixth goal two minutes from time. Tuncay Sanli has completed his move to Middlesbrough after being granted a work permit. Tuncay joins on a free transfer from Fenerbahce and is expected to join up with his team-mates in time to fly out on the club's pre-season trip to Austria next week. The news is a further boost for Boro boss Gareth Southgate, who is confident he has significantly strengthened his squad during the summer. Boro unveiled former Arsenal striker Jeremie Aliadiere on Tuesday and with Tuncay also on board as well former Real Madrid defender Jonathan Woodgate making his loan deal permanent, Southgate is delighted with the business he has done so far.